On 5th/6th June 2012 Venus will pass between the Earth and the Sun. It’s shadow will cross the Sun taking about 6 hours in total, although the length of that which is visible varies significantly depending on where you live on Earth. In the USA the beginning of the transit will be visible as the Sun begins to set on 5th June, while in the UK we’ll see the end of the transit after the Sun rises on 6th June. The planet Venus orbits the Sun inside the orbit of the Earth, and passes between the Earth and the Sun quite frequently. 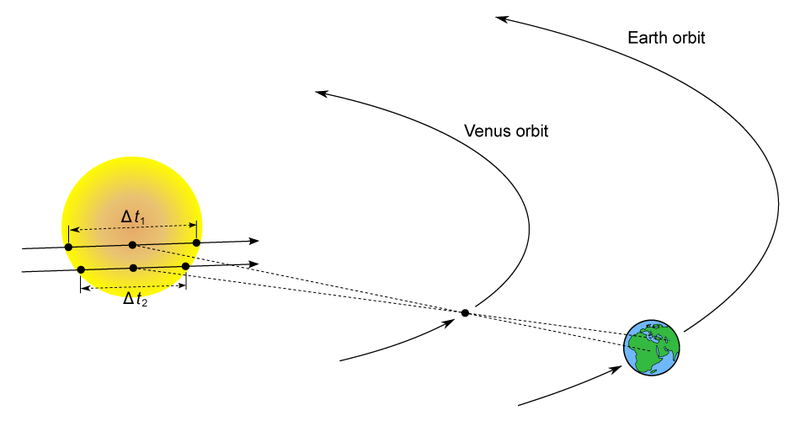 However the planes of the two orbits aren’t quite aligned, so most of the time Venus passes either above or below the disk of the Sun. Actual transits are rare, but very predictable. They happen in pairs separated by 8 years, and then after each pair follows a period of either 121.5 or 105.5 years without any transits. 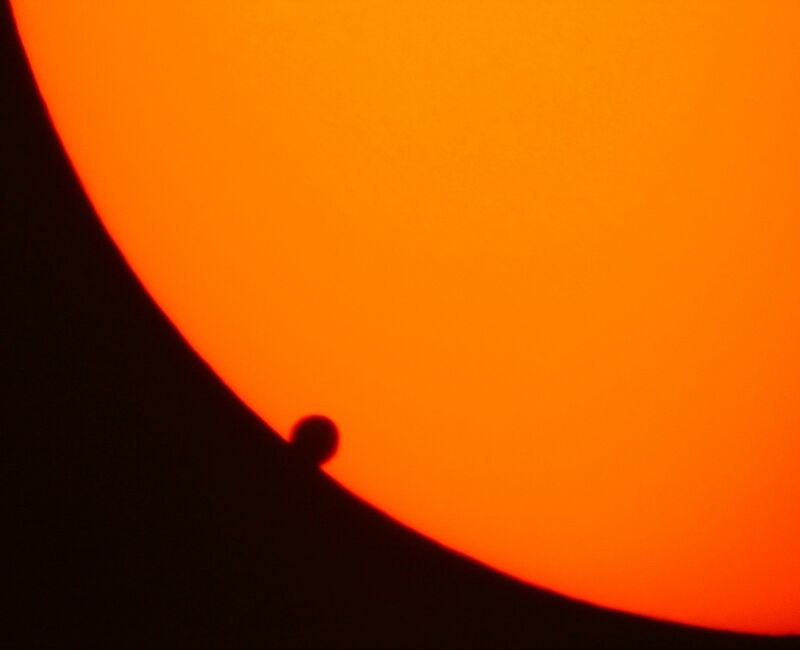 The 2012 transit is the second of a pair – astronomers around the world viewed the first transit of the modern age in 2004, and the next transit won’t happen until December 2117. To view a transit of Venus does not need to be technically challenging, but in its simplest form involves looking at the Sun – so some safety precautions must be taken. You must never look directly at the Sun! Serious eye damage or even blindness could occur if you did that, so take this warning seriously! My advice for viewing the transit if you are not a keen amateur astronomer, or able to get to a viewing party, is to either get your hands on a pair of Safe Solar Viewers (like these ones from Astronomers Without Borders), or to view the event via a web cam (like this one from Hawaii where the entire transit is visible, or GLORIA which is planning to show feeds from Australia, Japan and Norway). This last method also has the advantage (especially for UK viewers) of not being affected by local cloud cover, and has exactly zero risk of eye damage! If you come to one of my talks I hope to have solar viewers to hand out. So why should you care about a black dot crossing the Sun, or perhaps more pertinently, why do I, and an astronomer who studies galaxies, and works in a cosmology department care enough to write a blog post about it and give several talks? Well historically transits of Venus have been very important in helping astronomers understand the scale of the solar system, and from that the scale of the Universe. Basically when Venus crosses the Sun we know that it, the Sun and the Earth are all in a straight line. Very slight differences in the viewing angle from two observers on the Earth can then be used along with our basic knowledge of trigometry to measure the distance to the Sun. For over 100 years, the distance to the Sun measured this way was the most accurate measurement we had. From knowing the distance to the Sun, we can use slight changes in the apparent position of nearby stars as the Earth orbits the Sun to get their distances (more triangles – this is called the parallax method), and from those stars we calibrate methods which use stars of known or estimated brightness to estimate distances to nearby galaxies, and we jump from distances to nearby galaxies to more distant galaxies and eventually the whole universe. The distances to faraway galaxies have taught us that the universe is expanding and started in a Big Bang around 15 billion years ago, and even if we go to the observations that suggest the universe contains a mysterious “Dark energy” (which won the 2011 Nobel Prize in Physics), they are ultimately based on us knowing the distance to the Sun. So that’s why I think it’s important. Here in Portsmouth we’re running a workshop about the transit of Venus on HMS Warrior, in the Portsmouth Historic Dockyard. We plan to demonstrate the triangulation method by using it to estimate the distance from the Warrior to the local landmark “The Spinnaker Tower”. Two people will stand on the desk and we’ll mark out from them the direction to the Spinnaker Tower. Making one of the angles a right angle, we can then estimate the distance to Spinnaker (which is about 300m) by d = b/cos A, where A is the other angle, and b is the distance between the two people on deck. 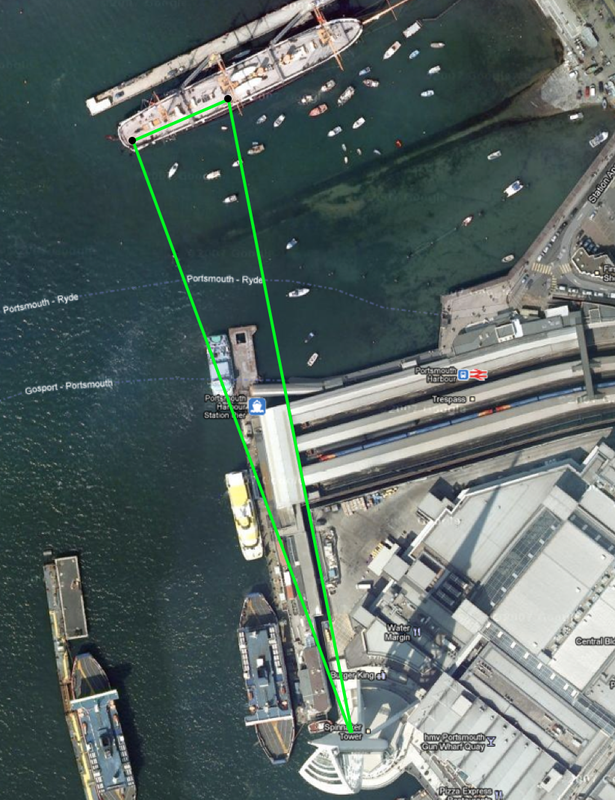 Google Map image of Portsmouth including HMS Warrior (top) and The Spinnaker Tower (bottom). This isn’t exactly the method used in the historical measurements, but it demonstrates the idea. Of course when observing the transit of Venus from two widely separated places on Earth, it’s not exactly easy to measure the angle between the sight lines. What Edmund Halley figured out in 1678 was that if you could measure the times when Venus stars and ends its transit you can get at the same information. In all of recorded history, we have records of a total of six transits of Venus that have been observed (1639, 1761, 1769, 1874, 1882 and 2004). You have to feel sorry for Johannes Kepler, who predicted the transit which occured in 1631, but then died in 1630. No-one is recorded to have used his prediction that year. 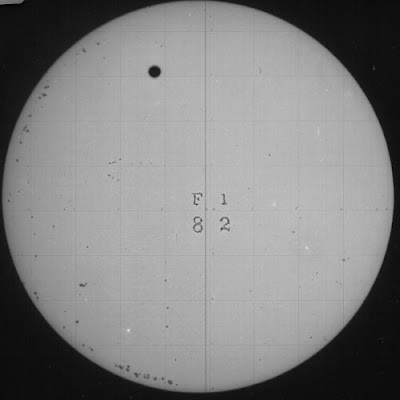 Jerimiah Horrocks and Willam Crabtree (two British astronomers who were friends) have the honour of being the first humans known to have seen Venus transit. Horrocks found and improved Kepler’s earlier predictions, and both men successfully observed the 1639 transit from Northern England (in December!). Scientific observation of the transit started in the 18th century following Halley’s suggestion to use it to measure the distance to the Sun. There is a hugely rich and entertaining history of these expeditions to view the transit, and several books have been published. I’m just going to tell you a couple of the stories which struck my interest! A lot more, and links to some of the books can be found via the Wikipedia page on Venus Transits, TransitofVenus.org, and TransitofVenus.nl. For the 1761 transit, two famous explorers got involved. Mason and Dixon (still in Britain, and before they set off to map the USA) were commissioned by the Royal Society to observe the transit from Sumatra. They met in Portsmouth, and set sail from here on HMS Seahorse (which a decade later would have a famous midshipman named Horation Nelson). Enroute to Sumatra they got attacked by the French (the French and English being at war then), and decided to give up. They wrote the Royal Society of their intentions and were promptly told they better get right back on the ship to observe the transit or else. They did, and eventually ended up viewing if from South Africa. The 1769 transit also had some famous viewers. Captain Cook was ordered to set sail in HMS Endeavour, partially to observe the transit from Tahiti, but then to continue on and look for the mythical “Australia”. On that trip they didn’t find Australia, but they did land and claim New Zealand. And in Tahiti, they set up a “Fort Venus” from which to stay safe from the natives and view the transit. This voyage is being repeated this year in a replica vessel, and you can follow along at the HMB Endeavour Website. These 18th century observations results in a measurement of the distance to the Sun of 153+/-1 million kilometers, which was a huge improvement over previous estimates, but not as good as they expected. The timings were thwarted by something which came known as the “black drop effect” where the shadow of Venus seems to bleed into the edge of the Sun. This meant that the start time of the transit could not be measured to better than a few seconds. The black drop effect, photographed in 2004. In 1874 several more expeditions set out, including several on Royal Navy Ships, such as HMS Volage, one of the largest mixed sail and steam ships ever built, which ferries the British expedition to the Kerguelen Island in the Southern Indian Ocean. Such measurements helped improve the distance measurement to 149.59+/-0.3 million kilometers. By 1881 it had been decided the distance to the Sun could be estimated better by other methods, although several expeditions still set out, and the first photographs of the transit were taken. A photograph of the 1882 transit, taken by a US expedition. The current best distance to the Sun is 149.5978707 million kilometers, +/- 3 metres, measured using radar ranging to the inner planets. It’s known so accurately that we can measure it’s changing, growing about 15 metres every century. 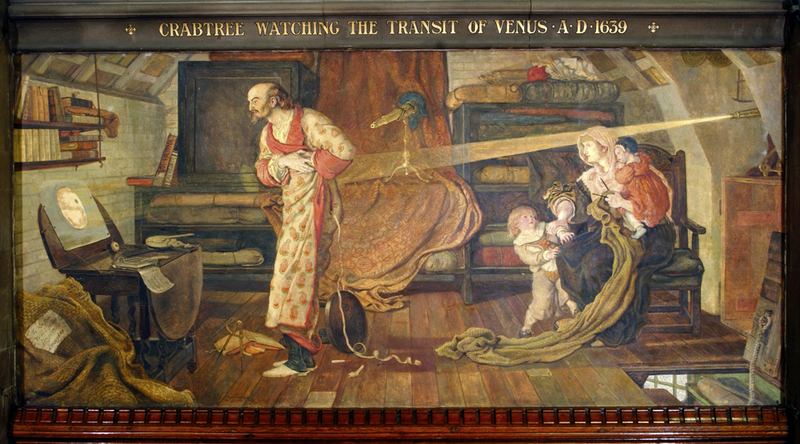 The first transit of Venus to happen in the modern age was in 2004. You can find videos of this event (like the one below), which I was lucky to view from a small observatory near Ithaca, NY while I was studying for my PhD in Astronomy at Cornell University. For the 2012 transit, apart from encouraging people to view the event as a last in your life time chance, there are couple of new developments. First smart phone technology which didn’t even exist in 2004 has allowed the development of a “Transit of Venus Ap“. In this Ap you can input the time you view the transit starting and/or ending, and participate in a global experiment to measure the distance to the Sun. Download the Ap in advance to practice inputing your measurement. Interest in exoplanets has also significantly grown, including the signature that the atmospheres of those planets might have in the observed spectrum of a star when the planet is transiting. The Hubble Space Telescope will try to simulate this type of observation during the transit of Venus, observing the light from the Sun reflected by the Moon (if HST looked at the Sun it would be destroyed) to search for the signature of the atmosphere of Venus. You can read more about the plans on the NASA website. Anyway I encourage you to get out there, or get online and view the last transit in our lifetime. Use the resources attransitofvenus.org, to work out the timings of the transit from your location, or search for local events. Other useful resources are the Royal Astronomical Society page on the Transit of Venus, in the UK, the HM Nautical Almanac Office. Also of possible interest, the Royal Observatory, Greenwich has a Venus Transit page, and a special (free) exhibit running until September 2012. And of course there’s a special Planethunters page on the transit too.